American merchant and mining magnate; born in Langenau, Switzerland, 1828. In 1847 he went to America with his father, who settled at Philadelphia; there Guggenheim began business life in the humblest way, dealing, as a traveling salesman, in such commodities as stove-polish and glue, which he afterward learned to manufacture and thus sold at a greater profit. Next he turned his attention to embroideries, gaining a large fortune by importing the Swiss products. In 1881 he transferred his business to New York city under the name of "M. Guggenheim's Sons." About this time he became interested in a silver-mine; in order to work it profitably he bought up a smelting-plant in Denver, Colo., and, with the aid of his sons, devoted himself almost exclusively to smelting operations, building a smelter, in 1888, at Pueblo, Colo. The firm then extended its operations throughout the United States, and even into Mexico, where it built the first complete smelter at Monterey, and another at Aguas Calientes. It was further found necessary to build refiningworks, which was done at Perth Amboy, N. J. By this time the firm had become the most important silver-smelting company in the world; it soon entered into a combination of smelting firms known as the "American Smelting and Refining Company" (1900), the firm of M. Guggenheim's Sons retaining a controlling interest. The firm naturally became interested in many mines, and a separate firm, called the "Guggenheim Exploration Company," has been formed to represent this side of its activity. 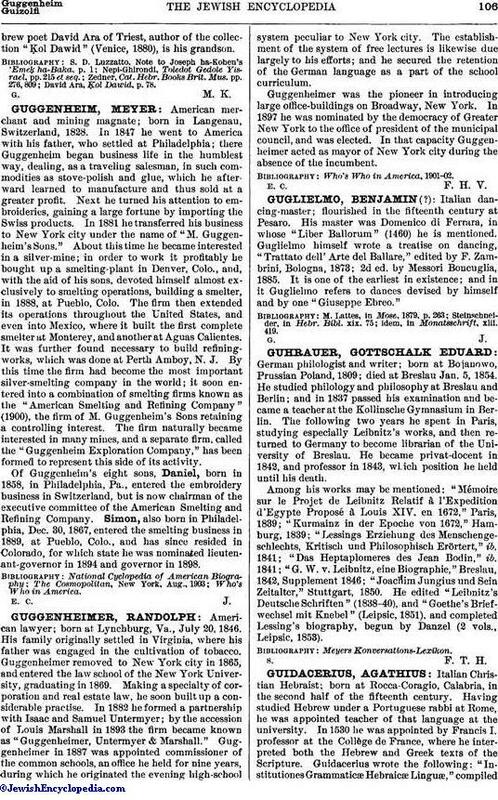 Of Guggenheim's eight sons, Daniel, born in 1858, in Philadelphia, Pa., entered the embroidery business in Switzerland, but is now chairman of the executive committee of the American Smelting and Refining Company. Simon, also born in Philadelphia, Dec. 30, 1867, entered the smelting business in 1889, at Pueblo, Colo., and has since resided in Colorado, for which state he was nominated lieutenant-governor in 1894 and governor in 1898.